Toddlers can be as fast as lightning for such small packages. Taking your eyes off them for even a second can have catastrophic consequences. In The Blink of an Eye, by Jesse Blackadder, is a powerful and heart-shattering story about a family living with exactly those consequences. Teenaged Jarrah loves his little brother, Toby, to bits. But sometimes he wishes his career-focused mother would stop taking his babysitting for granted. Artist and stay-at-home dad, Finn, agreed to the move from his hometown in Tasmania to hot, humid Queensland so his wife, Bridget, could accept a once-in-a-lifetime role in ecological research. I slapped my maths book shut, glad of the excuse, though I sighed and pushed myself up like it was a big effort. This was usually how it panned out in the afternoons. Dad distracted with his art, Mum busy and important and not home from work, me trying to do homework, and Toby trying to stop me. Changing towns hadn’t changed that. Jarrah is the only character who gets to tell his own story in first-person. We’re kept at a distance from Finn, whose story is told in third-person (‘he’ did this, ‘he’ did that). And Bridget? Wow, Bridget’s story is told in second person. She not only doesn’t get to tell her own story, but her story is told to her. I found this quite confronting to start with, never having read a book in second-person. You usually visit your mother in the nursing home after work on Thursday, but you missed yesterday and squeezed it in today instead. Finn is distracted, and Jarrah’s in his own teenage world, so neither of them asked how she was… today was bad. She didn’t recognise you at all. 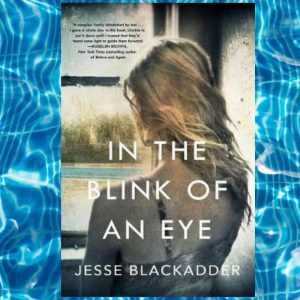 In the Blink of an Eye is a brilliantly written novel about a tragic event that happens, on average, 30 times each year in Australia in backyard swimming pools. Grief is complicated by finger-pointing and blame, but life somehow goes on – albeit altered forever. This was a deeply personal story for author Jesse Blackadder. Though a work of fiction, it draws heavily on her experience of losing her 2-year-old sister in a backyard pool drowning. Blackadder was twelve years old at the time. In a lot of ways, In the Blink of an Eye is teenage Jarrah’s story. Too often it’s assumed that a brother or sister’s grief couldn’t possibly equal a mother or father’s grief. That they will somehow get over their loss more easily because they’re a kid and kids are more resilient. Many times I just wanted to reach into the story to give Jarrah a huge hug and cook him dinner. I highly recommend this book if you have plenty of tissues on hand. Sounds like a confronting read, thanks for sharing it. Loved your review. I have always wondered how a second person POV would seem. I have only ever read a book with one chapter written in second person and I felt the narrator was talking to me. It was strange.